Well, Cafe Tropical might just make the best Cafe con Leche / Cafe Americano with steamed milk ever. Yes it is in Silver Lake. Just to make sure everyone understands … ever. Now don’t get me wrong $3.25 for a cup of coffee is no mean deal, and after paying that much you might also ask yourself what to call this delicious drink that they advertise as coffee. The Plate of the Day food blog covered the spot and describes the drink as Cuban. That makes sense as they had a menu full of ham with cheese sandwiches. With those sandwiches they serve breakfast. An overly filling breakfast too (maybe to make up for the price of the coffee). They had a ton of egg sandwiches, a ton of pastries, and all the servings were large (so large they single handily contribute to the obesity of this nation – did you see the size of the cookies?!). The food was reasonably priced where the coffee was not, but the coffee tasted sooooo good, while the food was average. No matter, if you have an extra five spot in the pocket and you need a coffee drink, go. Maybe the best damn coffee drink in Los Angeles. 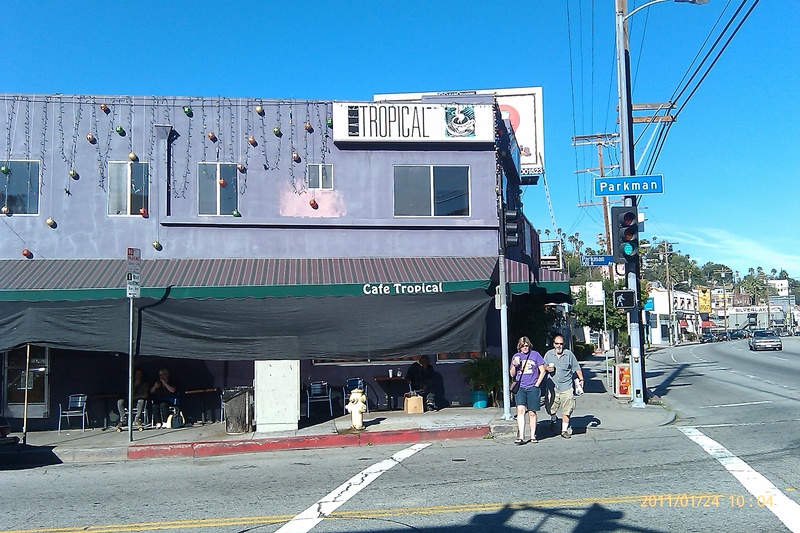 This entry was posted in Cheap Eats, culture, Food, L.A., LA, Los Angeles, Silver Lake and tagged Cafe Tropical, cheap, coffee, expensive, L.A. the Blog, Los Angeles, silver lake. Bookmark the permalink.